Artwork Panel: 28.4cm x 40.5cm ≈ 11¼" x 16"
Silk/Brocade: 37.5cm x 103.2cm ≈ 14¾" x 40½"
The Jō were warriors, allies of the Taira clan, in Echigo Province (present-day Niigata Prefecture). They were defeated in the Genpei Wars, and lost most of their power. 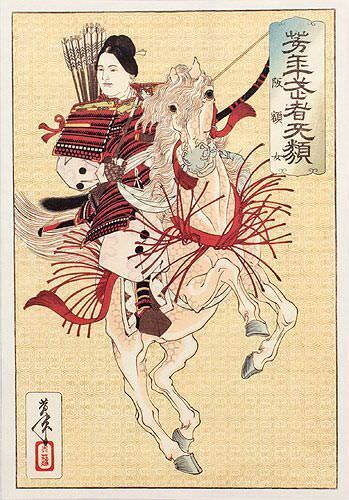 In 1201, together with her nephew Jō Sukemori, she raised an army in response to Sukemoto's attempt (the Kennin Uprising) to overthrow the Kamakura Shogunate. Hangaku and Sukenaga took a defensive position at a fort at Torisakayama under attack from Sasaki Moritsuna. Hangaku commanded 3,000 soldiers to defend against an army of 10,000 soldiers loyal to the Hōjō clan. Ultimately she was wounded by an arrow and captured; the defenses then collapsed. Hangaku was taken to Kamakura. When she was presented to the shogun Minamoto no Yoriie, she met Asari Yoshitō, a warrior of the Kai Genji, who received the shogun's permission to marry her. They lived in Kai, where she is said to have had one daughter.